Six riders gathered outside the Canoe Centre for our first post-summertime ride of the year with no-one admitting to forgetting to put their clocks back or turning up an hour early even though some did turn up suspiciously early. We headed through town alongside the river and out to Banbury Lane by way of Duston Park and then on to Gayton, where we were joined by another pair of riders. Once free of the A5 in Towcester, we got to enjoy the lanes that lie south of the town, out to Deanshanger and Passenham before avoiding redways of any description through Milton Keynes, although that was, perhaps, a mixed blessing as Wolverton Road doesn’t have the smoothest of surfaces, speaking of which we then left Milton Keynes by way of Linford Lakes, on a road famed in this group for the quality of its surface. Still, we got through and made our way out over the M1 and up through the Tyringham estate before arriving in Olney, bang on schedule. In the café’s courtyard, we even caught a Pokémon! (Note to readers – if anyone knows what that is, an explanation would be appreciated – Ed). We had an uneventful run back through Yardley Hastings, with some members of the group choosing the directness of the Bedford Road over the scenery of the Castle Ashby route, but we were all back, as it was said we should be, by 4pm. Cycling doesn’t stop when the clocks go back! Departing Moulton Co-op (NN3 7TB), 9.30 am on Sunday, for around 60 miles in total. The first leg of the ride takes us out through Old, Harrington and the outskirts of Desborough. We then follow the B669 towards Leicestershire and Stoke Albany, whilst all the time attempting to enjoy the increasingly ‘undulating’ scenery. It’s then on to Medbourne – where we link up with National Cycle Route 64 – and finally, Tugby where, after journeying along the delightfully named Crackbottle Road and crossing the A47 we arrive at Tugby Orchards, home of . Incidentally, the car park surface at Ventoux is laid out with the names of famous riders from the past. Yes, it’s a minor novelty but it does provide you with the chance to pretend you’re a proper Tour cyclist. The return leg of our journey provides us with some proper Rutland hill climbing – most notably in the area around Goadby and Horse Hill. Still, what goes up must come down and there’s a rather exciting descent which a road sign marks out as nine percent. This section of the ride is notably quiet given that some of the lanes we follow are closed to motorised traffic. Heading back through pretty hamlets like Glooston, Cranoe and Welham, we cross the Harborough Road soon after Great Bowden. The imposing HMP Gartree appears on our left as we cycle on towards Lubenham before rejoining the Harborough Road near East Farndon. Turning left we head through the Oxendons and then Harrington before linking up with the familiar route back to Moulton via Old, Walgrave, etc..
I’ve ridden this route a couple of times and, aside from the fact that on the last occasion I tore a calf muscle climbing Horse Hill (editor’s note: don’t do this on Sunday), I’ve always found it to be thoroughly enjoyable. The hilly bits are manageable and there are plenty of shops and cafés along the way should anyone require any additional refreshment or oxygen. Assuming there aren’t any major mechanicals or incidents then I predict we’ll be back at Moulton at around four-ish. Seven riders gathered at Brampton Valley Way on Saturday 8 October in crisp Autumn weather for a brisk ride to Ashby St Ledgers, which turned into something of an “adventure cross” ride – with an unexpected bonus at the end. Familiar roads took us through Long Buckby, which was busy with other cyclists out enjoying the morning, then north-west to Yelvertoft, and sharp south to Crick, on mainly good roads. After crossing the A5 we wound into historic Ashby St Ledgers and saw the famous room where the Gunpowder Plot reputedly was hatched. We then followed smaller unclassified roads from Welton to Norton, and the disintegrating road through Dodford Lodge Farm, which involves opening and closing four gates, then slithering along half a mile of deep gravel. Phil and Milton found this more fun than they could bear, and left us at the A5, mumbling excuses about family engagements… 🙂 The rest of us continued on the pretty but dodgy gated road through Brockhall, as it started to rain. After a further challenging surface from Whilton, we reached Great Brington. Here by serendipity we noticed some bunting and a “Pop-Up Cafe – Cyclists Welcome” sign outside a house, and swiftly agreed to stop. We were received very warmly by the purveyors of Great Brington Coffee who were running this “pop-up cafe” in their garden in aid of Scope. Not only were the coffee and the cakes excellent, but we discovered a shared interest in cycling with other guests, including a group of young women cyclists . After this well-timed stop, it was a short ride back through Althorp and Church Brampton to the star for a round trip of 38 miles. Thanks all for your company. PS I set off afterwards for an extra loop, only for my rear gear cable to snap after a couple of miles – which made for an interesting limp home, with only two gears… At least it didn’t happen on the ride! Seven riders assembled at Brampton Valley Way on a crisp sunny morning for Ian’s ride north to Kilworth. Milton showed off his new Titanium tourer in stunning silver before we left. Once we departed, the Brampton climb gave the group a heart thumping start to the morning before we settled into an easy pace. With time on our side before the first café was due to open, we ambled along without any great urgency and everyone enjoyed the relaxed atmosphere. The first few miles towards Teeton really undulated. One quick downhill followed by the uphill equivalent almost immediately keeping the ride interesting but the group together. Horses at the Teeton junction gave the group an impromptu stop before moving on through the village. 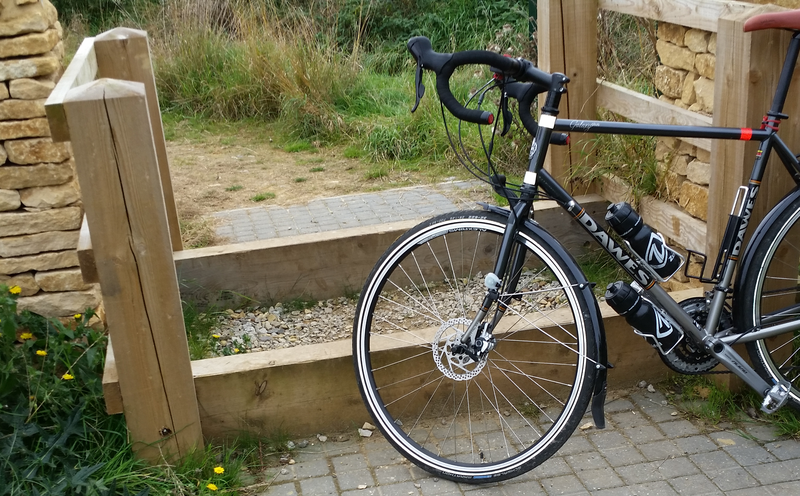 Milton tested the tourer on the downhills and it tested him on the uphills. Creaton passed in a moment and it wasn’t long before we were meandering through the glorious Cottesbrooke estate anticipating the big climb at the end but Ian cleverly avoided that with a left turn through easier terrain. Naseby beckoned and with a quick u-turn along the way the seven were back on track as we headed passed the majestic All Saints Church in all its splendour in the morning sun. Skirting the Cottesbrooke estate again gave us a bit of respite along flat roads that allowed the group to up the pace towards the first cafe stop at the World Peace Café at the Buddhist Centre. Right on cue we arrived for elevenses in the tranquil setting with the sun shining perfectly. Over tea and cake riders revealed how many bikes they owned. Some going into double figures! Leaving Kelmarsh there were six, with Milton going his own way home. The rest of us doubled back and headed up the long haul to Sibbertoft and onto the Welford Road allowing the group to open up a bit on the open roads. The gliding school alongside giving a lovely backdrop against the sunny skies. Now Nick left us. A perfect day for gliding and cycling for that matter! At the next junction a plane flew low overhead towing a glider on a line on its way to the release altitude. Perfect timing. A country lane or two later we approached the urban road of North Kilworth before entering the more picturesque location of South Kilworth soon after and made our way swiftly through. After Swinford we entered the impressive grounds of Stanford Hall. Roads that were made just for cycling through. Just walkers and us. Villages with names like Stanford-on-Avon and Clay Coton summed up the wonderful location we were riding in. Purely Idyllic. Wind turbines seemed visible from all angles in the distance and all moving steadily in the breeze. The Red Lion at Crick was our next port of call and we were accommodated quickly by the friendly staff. John Cuttler had ridden in and joined us for lunch too. Roast dinners consumed and pints put away we were soon on our way again for the last leg of the ride. Leaving Crick we headed for Watford – as in Gap not Watford Herts. But not before long we were climbing into Long Buckby and out the other side. A road closure some way along didn’t divert our ride and we breezed through it enjoying closed roads for a while. Brington church then came into view and the mood changed with thoughts of the climb in mind. Probably the hardest climb of the day was left to the end but everyone climbed admirably. The long stretch at Church Brampton was the only rise left to do before turning back the way we had come and the finish at the Windhover. A great days riding in perfect weather.